The Exploring Leadership Program provides professional development to candidates who are interested in pursuing leadership opportunities at their school site. The program aligns with the pipeline work of the Leadership Development Office to consistently develop a steady stream of teacher leaders who are current in district philosophy and practice. Future Administrators is designed for proven teacher-leaders who wish to prepare themselves for a career in administration. Selected candidates will participate in a series of workshops and mentoring beginning in early Fall through late Spring, and upon successful completion, may be eligible for assistant principal or related leadership positions. Interested candidates for the current school year should preview the Future Administrators tab for more information about the application / selection process. Continuing Future Administrators provides additional training to candidates who have completed the Future Administrators’ Program. The program builds on the pipeline work of the Leadership Development Office to consistently develop a steady stream of future administrators who are current in district philosophy and practice. The Clear Administrative Induction Credential Program is for current district administrators who need to clear their Preliminary Administrative Services Credential (formerly known as Tier II). It includes a program of coaching and professional development designed to meet state requirements. New Administrators includes all first year assistant principals, who simultaneously participate in the Clear Administrative Induction Credential Program. New Administrators will attend a series of professional development workshops designed to provide a firm foundation in current administrative practice and district philosophy. Aspiring Principals Program including all Year 2 and/or Year 3 assistant principals should contact the office of Leadership Development to enroll. The Aspiring Principals’ Program prepares candidates for the principalship. New Principal Support Program includes monthly support meetings. First year principals meet monthly and second year principals meet every other month throughout the school year. Transitioning Principals participate in a Change of Principal workshop primarily conducted throughout the summer season. Coaches Program includes professional development and support meetings yearly. Coaches are assigned to support Clear Administrative Induction Credential candidates and New Principals. Support meetings for coaches are scheduled throughout the year. 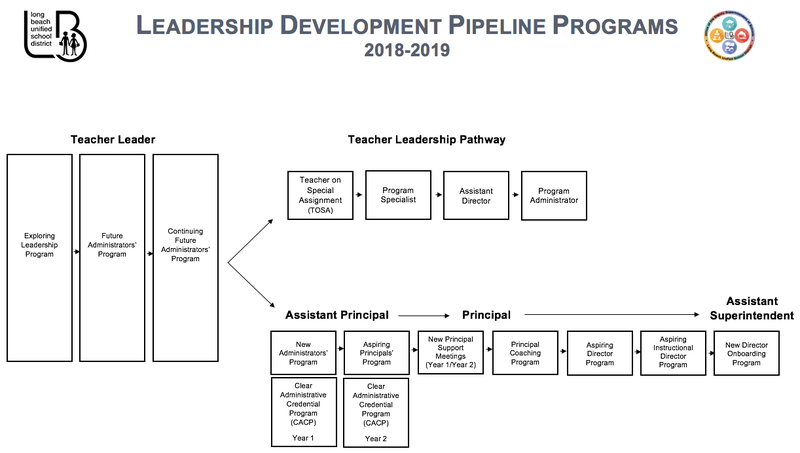 Aspiring Directors Program continues the pipeline work of the Leadership Development Office to prepare a steady stream of principals who are current in district philosophy and practice for Central Office positions (e.g. Student Support Services, Human Resource Services, OCIPD). Aspiring Instructional Directors Program continues the pipeline work of the Leadership Development Office to prepare a steady stream of principals who are current in district philosophy and practice for positions of principal supervision and support. New Director Onboarding Program continues the pipeline work of the Leadership Development Office to support new directors in their day-to-day work of principal supervision and support.